Dan Jones is one of my favorite nonfiction authors. This is the fourth book I’ve read by him and all of them have been very good. Which is a huge feat since he writes extensively across medieval to renaissance history. He’s written a book about the Plantagenet dynasty, the Wars of the Roses/the rise of the Tudor dynasty, the Magna Carta, and the Templars. 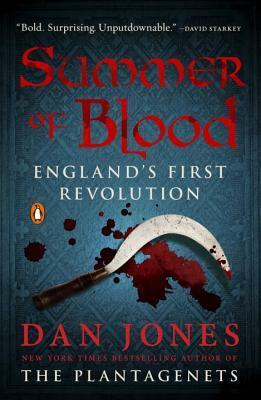 This book, however, focuses on the 1380s with Richard II’s rule and the time when England’s peasant class rose up against the ruling class that was trying to tax them to a point never seen before. I’ve never heard about the Peasant’s Revolt of 1381 and I have passing knowledge about Richard II’s rule — mainly his deposition from the throne and following death — so it would seem that I could be lost quite easily by the story. But, Jones is a fantastic author. He paints a picture and logically explains who various people are. Lucky for me, a lot of the same people and titles show up in the Wars of the Roses, so I have something to help me, but I could see this book being easy for someone with no outside knowledge. The book naturally goes through the events, laying out background information, important players, what happened, and the aftermath. It was simple to read and engaging the whole time. Jones has such an easy style to read because it’s formal yet informal. It doesn’t feel like you’re reading a textbook, basically. And, that’s a huge plus in all of his books. It’s a small book and only took me a few days to read — it would have taken longer, but I had a few days off thanks to snow and using some personal hours — and I enjoyed it the whole time. I didn’t really want to put it down once I got into the history. Overall, highly enjoyable. I’d recommend Dan Jones to anyone because he’s so easy to get into. Have you ever read Dan Jones’ work or seen his show? I haven’t read anything by him but my interest is piqued now! He’s definitely more medieval history, but I really love his style and topics! Great review! Not read any of his books (but I’ll look out for them), seen some of his TV shows. Thank you! I’d definitely suggest them because they’re solid. Consistently good, really, which is sometimes hard to find.